Well, there was a close 3 way tie in this time around and then one book pulled ahead by one vote. Be sure to check out our group on goodreads.com here. Nominations for the new year will pick up 2 weeks on the 15th of Dec. Hope to see you all then! I'm already about halfway through and it's pretty decent so far. I think the movie should be worth watching. I think I got my copy off amazon for something like $6 here. Just included a link in the OP so you can find the best place to buy it, should you choose to join us in our last book read of the month. 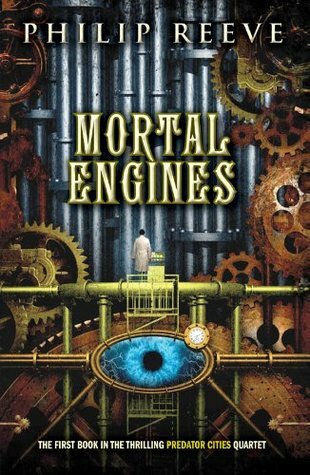 Look for the yellow "Mortal Engines" link. The movie trailers (due out in mid december in theaters) and the synopsis sounded cool enough for me. I've started reading it yesterday. It's a bit...weird. Doesn't help that I saw the movie trailer before I started reading, which kind of nullified any attempt to create the book's universe in my head. 90% done! Where you all at with the read? it's, uh, sitting on my kitchen table? well what the hell you waiting for? It's a city eat city world out there! Next week, January nominations thread will go up. Start thinking about how you want to begin your year with your book nominee! Surprisingly good book so far, interesting concept for the cities. I am hoping the movie can remotely resemble the novel. As am I, I plan to watch it a buddy of mine over my winter break. Started mine yesterday. This seems like it is going to be another good one. I want to finish it before I see the movie. The movie comes out on the 21st! Get movin'! LOL! I finished today. It was a really good book. I can't wait to see the movie and compare the two. I will probably get the other two and go through them as well. The movie actually came out on the 14th. See what happens when you live in Spain? You cant even get the dates to things correct. FML tell me what you think of the movie!